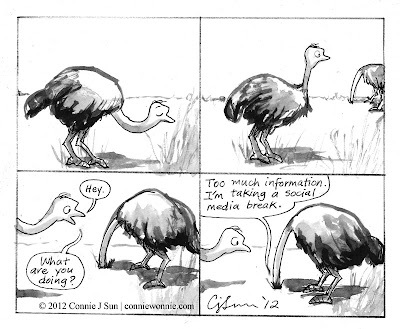 Some days I feel like an ostrich. Ran out of time to color, but you get the idea. Happy Friday! Connie Sun is a cartoonist and writer, based in NYC. She draws a comic strip about being a single, odd, and introspective human with a wise elephant companion. Her cartoons have been featured in The New Yorker, NPR, Buzzfeed, Upworthy, GoComics, McSweeney's, Climbing Magazine, Tabi Labo, Angry Asian Man, and She Explores. All Content © Connie J Sun 2010-2011. Simple theme. Powered by Blogger.